This conger eel was caught from the fishing platform in Rocks Road, Nelson while fishing after dark. The conger eel is sometimes caught by boat anglers and surfcasters when fishing over or close to a rocky or sandy bottom. However, they are not usually caught over a muddy bottom. Surfcasters are more likely to catch a conger eel after dark when they become more active. They seem to feed mostly at night but are sometimes caught during the day. Generally, they hide in caves and amongst the rocks until nightfall. 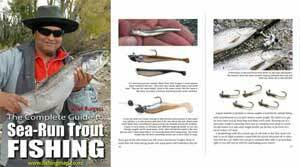 They are mostly caught by anglers as a by-catch when fishing for more desirable species. Any angler who fishes from the rocks or beach close to kelp and other seaweed will know that this is a prime area for congers. They can also be found in deeper water down to about 100 metres. They have been caught as deep as 230 metres over North Reef, Otago. The average size conger eel caught around the New Zealand coastline is something like 1 to 1.5 metres. A really big one can grow to 2 metres. However, the bigger congers tend to get fatter rather than longer. According to the late David H. Graham, in his excellent book A Treasury of New Zealand Fishes, he once saw a conger eel in the Dunedin Fish Market that measured 80 inches and weighed 36 pounds. By my calculations that is 203cm and 16.3kg. Graham also reported that conger eels weighing 60 pounds (27kg) were also caught off Otago Heads. The largest conger eel on record, according to Graham, was caught in England, and pictured in the Illustrated London News, on 17 September 1904. It measured nine feet in length and weighed 160 pounds (72.4kg). Conger eel close up picture of the head (image). Saltwater conger eels differ in appearance from freshwater eels in several ways that are easy to spot. The lower jaw of a conger tends to overshoot the upper jaw. Also the eyes are larger in the conger eel. Smaller conger specimens are more grey in colour whereas older congers become dark brown towards black. Congers have no scales. Congers feed on crabs, octopus, squid, shrimps and small fishes. They have a single row of very sharp teeth in each jaw. Congers are very difficult for the angler to kill and are capable of inflicting a severe bite. Even after being struck firmly on the head they can still live for a long time afterwards. If surfcasting it is best to haul congers up the beach with a long-handled gaff. 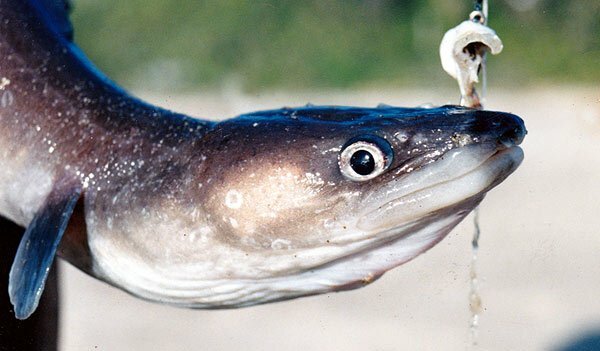 Conger eel seems to prefer fresh baits. Fresh fish cut bait and squid work well. This species is quite good to eat and is sold in the shops as steaks or fillets. It is excellent when smoked. Conger eel caught surfcasting near French Pass, Marlborough Sounds.